It’s taken a ton of time to get the “feel” of this game to work correctly, and I still have a long way to go. 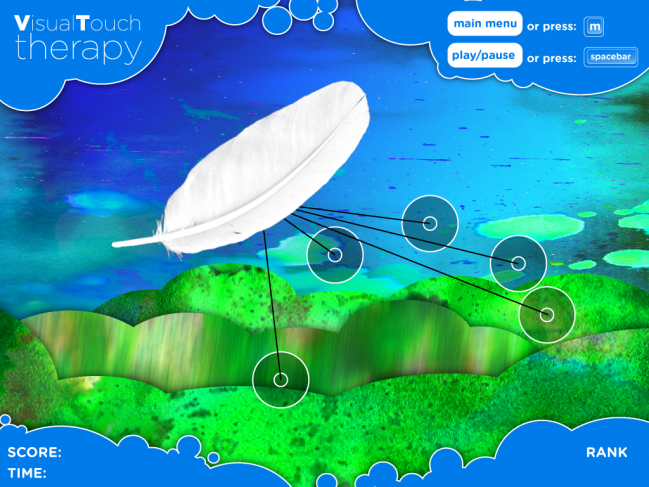 It basically took me three days of coding to make a feather fall from the top of the screen. You’d think it would be simple– but I had to add in all these other forces that can manipulated it while it’s falling in a straight line. Stupid math… but I am happy with how it looks, at least, so I wanted to post a screencap of where I’m at with it– it also has the new GUI which is currently implemented in the main game. The goal is to keep the “feather” off the “ground” by using your fingers– the more fingers you hold up, and the higher you hold them, the less “gravity” the feather has. This is an ideal game for people just getting back their mobility in their hand enough to hold it off a table, as well as those who are having problems extending their digits.